A Consuming Passion! : Fabulous prizes, great deals....Let's hop! Fabulous prizes, great deals....Let's hop! Hello, this is a long post today so grab a cuppa and make sure you read everything (I'd hate for you to miss out)! Today's blog hop at AnnaBelle Stamps introduces two new stamp sets and a range of gingham ribbon. If you hop along with us leaving comments along the way, ending at the AnnaBelle Stamps Blog you could win one of two prizes. 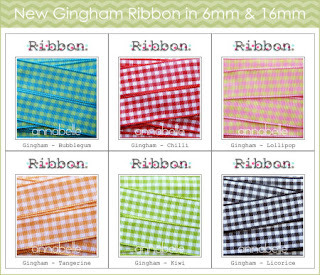 The second prize will be 2 metres of each colour of the NEW gingham ribbon. The ribbon will be sold in 5m lengths like our DF Satin ribbon. OK so there are the prizes for hopping along with us. The Hop will stay open until AEST 8pm Sunday 20th with the winners announced on the ABS blog on Monday. Combo special - Standing Tall and Designer Flowers - discounted by 20% for this weekend only! If you happen to be the lucky winner of the blog hop and have ordered them, not only will the stamp costs be refunded but Andrea will also include some new gingham ribbon samples! There will be a special link in the store to purchase the set combo. 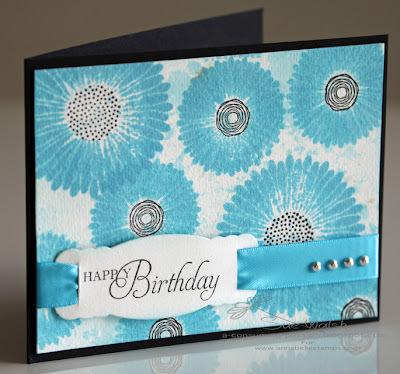 The Blog Hop starts and finishes at the AnnaBelle Stamps Blog. If you arrived here from Andrea's Blog you're on the right track! When you leave me you hop over to Kylie's blog. I have a few things to share, starting with a Desk Calendar using 'Standing Tall', which is a 4" x 6" set . I've also used ABS Rose polka dot digital paper, from the Chilli Collection, with the matching satin ribbon and Sprinkles. I should also say that I stamped the grass from an older ABS set 'Sentimental Bluebells'. This calendar uses one of the plastic picture frames as it's base. I've used Prisma pencils to colour the image, popping up the centre petals and adding some Dimensional Magic for shine. Next I made a card using 'Standing Tall'. I picked two of the smallest images to create the floral strip on my water colouring card stock. I've coloured this time with Inktense pencils that really give you such vibrant colours. For the centre of each of the flowers I added a tiny licorice Sprinkle. 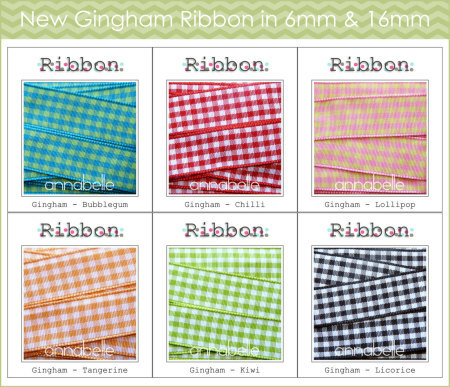 The pretty gingham ribbon is ABS NEW 6mm Lollipop. I've also created a frame using Cuts By Design 002 shapes 1 and a small circle die. 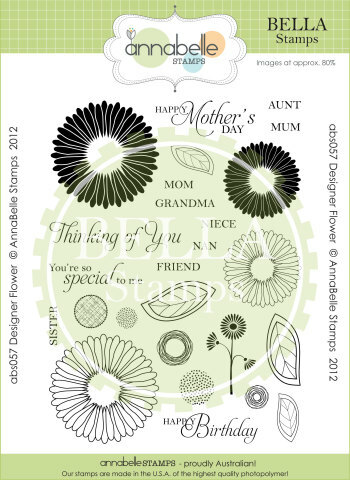 Moving on to Designer Flower which is a 6" x 8" set with a great mix of images and sentiments. The larger solid image reminded me of fireworks seen in the sky at just about every major celebration here in Australia. So with this in mind I made my first card. I've played with Distress ink and PerlEx to get a pretty glittery background before double stamping the images, using black for the centres. ABS turquoise satin ribbon was threaded through a Cuts By Design 002 Shapes 1 label and finished with four silver Sprinkles. 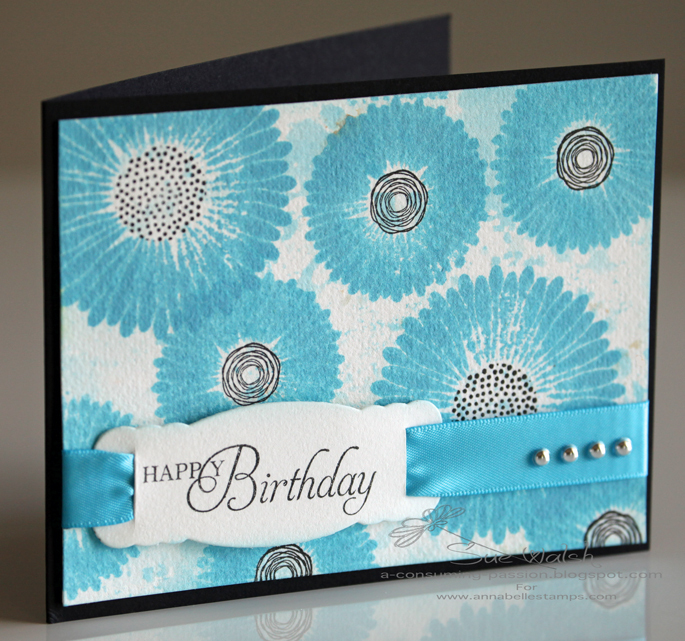 My last card uses the smaller of the solid images plus two open images which I stamped in VersaMark ink. Inks used here are VersaColor turquoise, lilac and topaz. The gingham is more of ABS NEW 16mm in tangerine. Whew.......if you got to the end of this long post.......well done! Now you can hop over to Kylie's lovely blog......Enjoy! All items used have been linked to the store. You can view the AnnaBelle Stamp Store by clicking on this link. So pretty Sue! 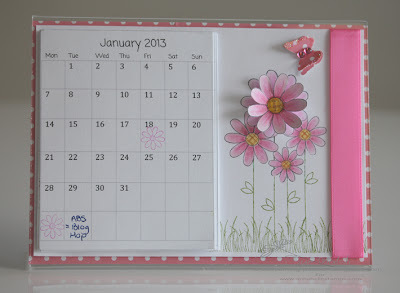 Love the pop of the pink flower on the calender. The spotlighting using frame on the second card. Sue, these are super amazing! 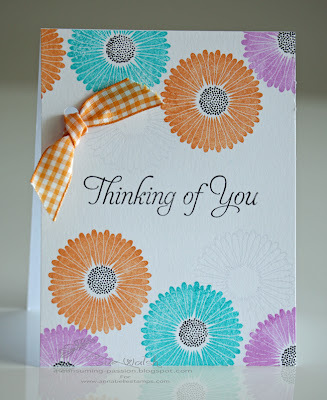 I especially love your sweet die cut window card with the little flowers... that ribbon ROCKS! All of your cards are terrific, Sue, but I have to say that the "Thanks so much" card is my absolute fave. I love how you've used the frame to highlight the four flowers. What great projects. Love the calender - with the special day stamped! Love the tips with the dies - circle centre and little slits on the sides for ribbon - might just CASE those. Great new sets and ribbon. Thanks. Gorgeous creations, love these new sets and love how you have used them! These are gorgeous cards Sue, I love the calendar and the floral strip. I must investigate inktense pencils, the colours look amazing. Lots of gorgeous projects - can't pick a favourite! oh my, that calendar is breath taking. I think I would never change the page from January...gorgeous! WOW! I want to win this set. It's great. Wow... These are gorgeous and just love the calender. Gorgeous cards!!! Love them all. TFS the calender too. LOVE your sweet and adorable calendar, simply love the colours, Sue and WOW your cards are drop dead gorgeous, loving your colour choices too! Sue, all of your creations are gorgeous but I am in total awe of your great calendar. I have been making some this year and your design is terrific. Love both of these sets! LOVELY cards...I like how you attached the ribbon on the last card. Wow!! Such trendy and innovative cards! Love them! such inspiration! Your cards are just gorgeous!! and I really love that calendar! These are really pretty! I am loving the gorgeous sentiments in these sets!! These are really beautiful I love the detail in the flowers and what a great calendar you created! 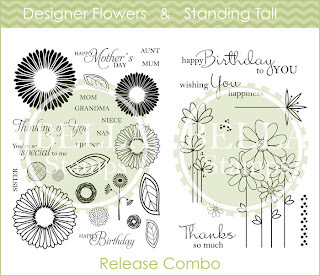 Great cards...love the calendar and the 3d flower. But the little detail that really caught my eye was the gingham ribbon threaded through holes on the last card's base...what a Great idea! Sue these are amazing, all of them! I especially love the 2nd one it's so sweet, and the colours of the 4th, but the calendar is so clever and the turquoise, WOW!! Very pretty. I like the idea of the mist background behind a "firework" of flowers. What a wonderful projects. I lvoe the pretty cards and the watercolour effect on the blue flowers! Great work. Awesome cards! I really like the Standing Tall set. Thanks for sharing. Thank you for sharing all your wonderful projects. Love the fireworks. Also love the card with the licorice centres (can't you just tell I like lollies!). Love the vibrancy of this card - I'm not familiar with Inktense pencils but think I might need to be! What great projects. I love the new stamps. I can't wait to get my order. lovely - enjoyed my visit! These are great creations. I'm all for popping, bling, and shine. The colors on your cards are wonderful! Love your work with the new stamps. Very inspirational! Beautiful job Sue! I'm reeaallyy fond of your calendar! The Stamping Tall set is my favorite and you did such a lovely job with it! My favorite is the calendar. All y'all are very talented. Love them all. Beautiful projects! Love the dimension on your calendar page from the 3-D flower! wow wow wow!! All your cards are beautiful!! All of your projects are awesome Sue. 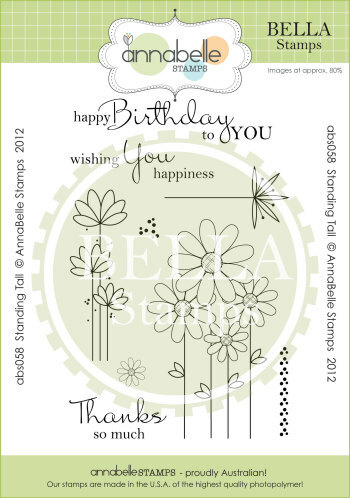 Love the calender idea and how you highlighted the small flower on your 'Thanks so much' card. Beautiful work. Beautiful cards..love the new stamp.. Simply stunning cards, love all the designs and vivid colors. The calendar is so beautiful too with the pink flower giving the 3D effect!!! Oh wow really lovely cards Sue, the calender is a super idea - will be putting that on my 'have a go' list. How fun to see all these gorgeous cards. I especially love your calendar. Oh dear, I think I am falling in love with these stamps! They're all gorgeous, Sue! I especially love the second one - I love how you've used the die! Want to win some new stuff!!! !